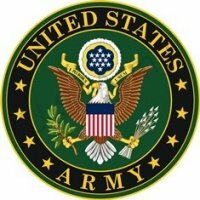 My wife and I are retired Army, but were staying on WSMR while working as contractors on the Ft Bliss ranges just south of WSMR. Our experience here was quite good. The WSMR contonment area is small compared to most Army bases visited, but has everything we needed except diesel fuel. We were able to tour the White Sands National Monument and the Trinity Test site while we were in the area. There are also old and active gold mines and trails nearby to explore. The park showers need serious attention. The night security lights were not operational the whole time we were here (we did call the MWR office about it). Parking is very spacious for RV as well as dinghy vehicles. CAUTION** Be sure to watch for Orick (large South African antelope) while driving on SR-213 (War Road). They are big animals and would cause lots of damage if they were hit. 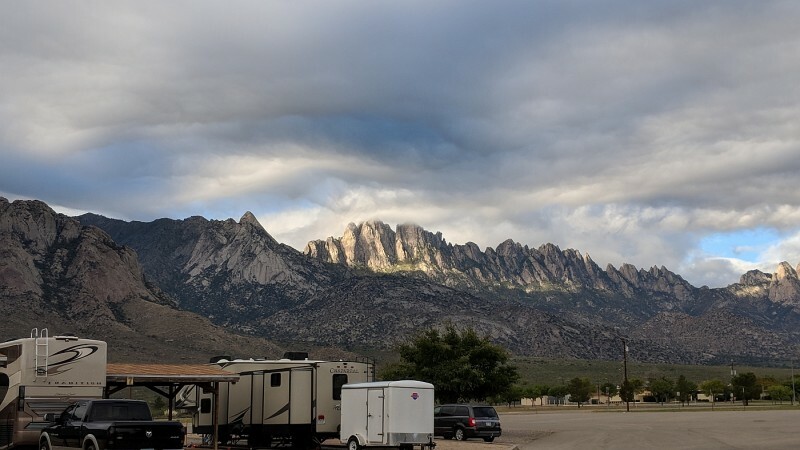 We parked here for the 1st time and the RV park is small but it's really nice. The view from your front windshield is awesome. The only draw back we found is that the street signs are not placed where you can see them. When we came through the main gate and passed the Headquarters Bldg we were looking for Aberdeen St. We did not see a sign on our side of the street and we drove a few blocks further till we found a place we could turn a 40 foot MH with a toad. When we got back to the Headquarters we saw the sign on the right side of the street, there needs to be a sign on the other side of the street too. 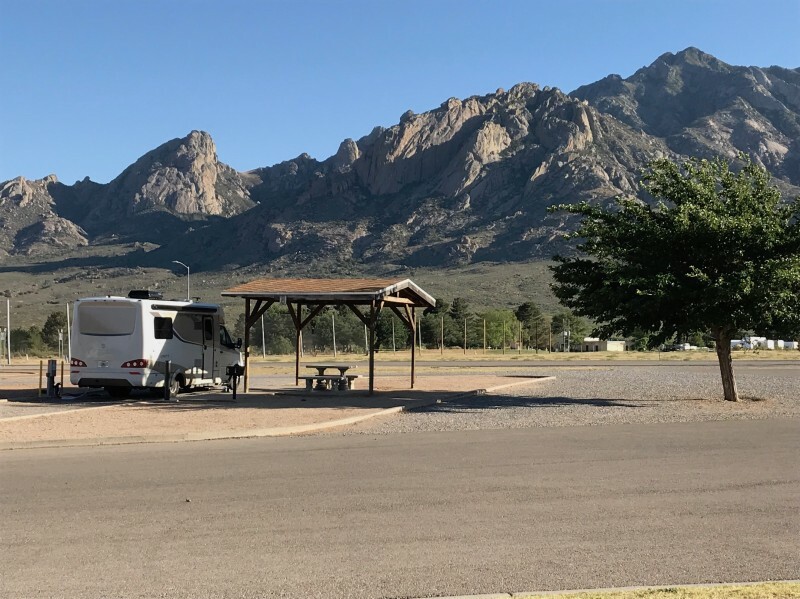 There's no doubt we'd stay here again when we're passing through Las Cruces, the staff at the Outdoor Office were very friendly. Second time staying here. This is a very nice campground. Only 8 spaces, but was never full while I was here. It looks like there is overflow on one of the roads leading into the park with electric hookups. There was a motor home that stayed there most of the time. At other times it was seen in various parking lots on base. On the way out, another motor home hooked up to electric there. This is a small base or at least from what I can see. One of the other campers works on the base with construction. Did not see any buildup of troops since last visit. Only problem this time was wind. It is quite a drive to Las Cruces. Like one of the campers said, you pay the prices here or it is a 30 mile or 50 mile drive to something else. Definitely will stay here again when coming through. Would go back in a heartbeat-this was 2nd visit and would return and hope it isn't windy!! Beautiful views and peaceful and great water pressure..super value for $10. 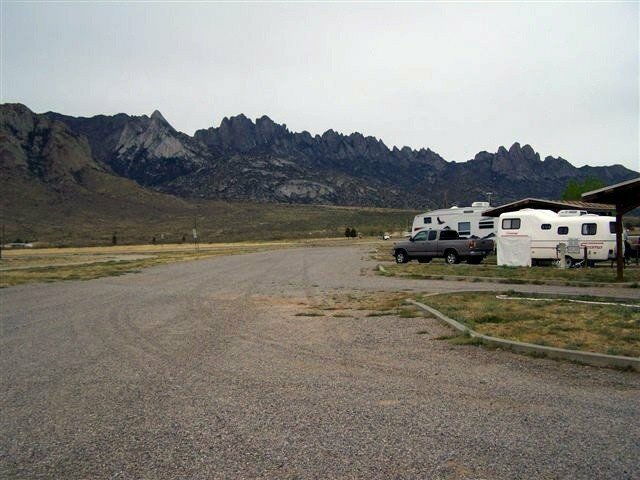 Small base (now) about 20 miles from Las Cruces...no diesel or recycling on base. 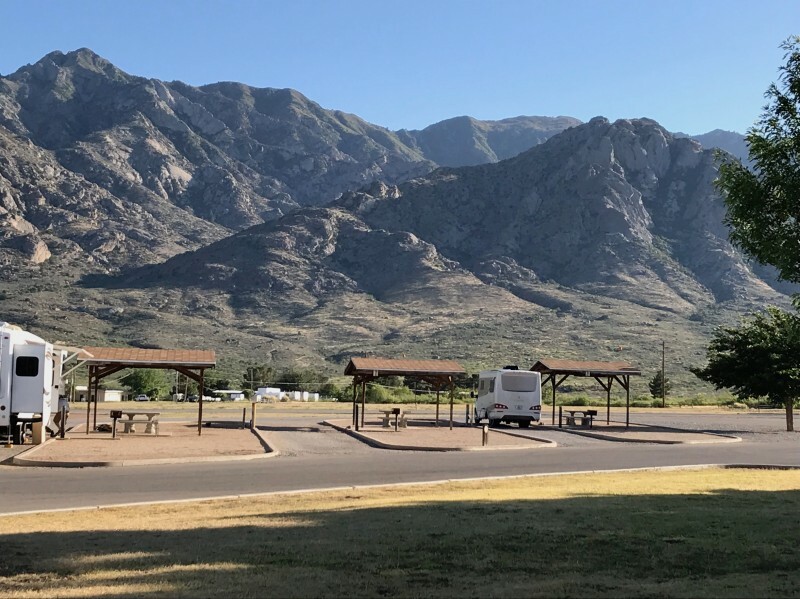 A laundramat by post office (which is helpful with receiving general delivery mail) is driving distance and a club within walking distance of rv park. The outdoor rec people-Gerry & Kim are super (we pulled in with tow car trouble and when we called outdoor rec Gerry came over within an hour to offer assistance). The auto hobby shop is great-they helped us and we had work done there as well as they also 'rescued' and worked with 2 other rv'ers! As someone else said be aware of dip in road by fire dept and auto hobby shop. Auto Zone in town gives military discount. Be aware not to plan during November time frame when the Colonel has her rally! This was our second visit. Since we're desert rats, we love this place! Unfortunately the golf course was closed for the week for an up keep period........boo hiss! We'll come back! I'd love to see them add some sites! This a great little spot. It is quiet & if you like the desert, very pretty. The directions which are posted are correct. WSMR is actually only 17 miles East of Las Cruces, NM (on the East side of the mountain) and on the South side of US 70. Our stay was only one night, but since we live in Northern NM, when we want to go to warm weather, we'll plan on going back for a long week end.